Some cool ideas and an ominous tone, there’s lots to like about this movie, but it still never quite reaches the levels of excitement that it should. This movie is well made and interesting, but it’s not nearly as exciting as it should have been. It’s the story of Batman first starting out and also of commissioner Gordon dealing with the corruption of Gotham. Only the film focuses much more on the Gordon story than on the Batman one. We get the minimalist approach to how Batman becomes the hero, and instead spend tons of time with Gordon, his wife, his boss, and his nemesis on the police force. The movie plays like a film noir in the seedy underworld, and that makes for some cool visuals, but the action never really goes as far as it should. An animated movie about a superhero should have great action and this movie just doesn’t. Batman: year one is definitely a cool and well-made movie. As far as artwork goes, this one is terrific. As far as story and action go, it’s just okay. The action that is there, on the screen, is done well, but the only problem is there isn’t really enough of it. Especially towards the end of the movie, when we should be getting a climax. The advantage of making a movie animated as opposed to shooting it live action with real actors in the roles (instead of just lending their voices), is that you can do so much more with animation and do it safely. There is no stunt in the world that you can’t do in animation. And if it’s an action movie that we’re talking about, then there’s no reason not to take advantage of that level of freedom. 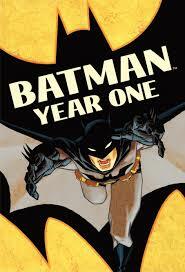 Batman: year one does not. The movie is based off of a frank miller graphic novel. Miller is probably the most famous graphic novel artist in the world. He’s the guy who penned sin city, 300, the spirit, and a trilogy of Batman graphic novels. The movie Batman begins, by Christopher Nolan, really seems to be based on the graphic novel miller made of this film, in lots of ways. So do some of the other movies in that Nolan trilogy. If this graphic novel is the inspiration for Batman begins, then I’m betting his other graphic novels (2 of them, the dark knight strikes again, and the dark knight returns), were the inspirations for the other Nolan films. I definitely know that they included the joker as the main villain. As far as the title Batman: year one goes, this was the title the first movie of the Nolan trilogy was being given back before that movie ever got made, when Darren Aronofsky was supposed to direct it. I remember hearing all about this back in 2001 or so, and it sounded terrific. Aronofsky was coming off of requiem for a dream. Nolan was coming off of memento and insomnia. Both were inspired choices for a director. Both were darker and more independent film rooted than the usual superhero filmmaker. So was Sam Raimi for that matter, who had just made the spider man trilogy, only Raimi has started small and then grown big, showing that he could handle somewhat big budgets (Army Of Darkness, Darkman.) Christopher Nolan and Aronofsky never got those chances to demonstrate what they could do. With Batman begins; Nolan was kind of thrown into a film with the biggest budget he had ever seen. When Nolan officially took over the reigns of the project from Aronofsky, the title changed from Batman: year one to Batman begins. Still, I’m willing to bet many of the ideas carried over. Maybe with Aronofsky’s film, it would have been more true to the graphic novel (the way the movie Batman: Year One is), and with Nolan’s film, he made significant changes including the addition of Ra’s Al Ghul and the scarecrow. It’s a good thing that happened, because Batman: Year One doesn’t really have a whole lot going on when it comes to villains. The movie isn’t all about how Batman came to be either. It’s a little bit about that, but there is no inclusion of a character like Luscious Foxx, for example, who would help bridge the gap of an idea to be a superhero with the reality of having these crazy weapons at your disposal. Instead, the movie is mostly about Commissioner Gordon. He is a huge part of the film, on screen as much, if not more than Batman is. That’s one of the many ways this movie tries to ground itself in reality. Another way is that there is no monster villain of any kind. No villain here is larger than life. Nolan’s trilogy had a monster villain in each film, from the scarecrow to the joker to bane. This movie’s closest attempt is to give us a handful of scenes with the Catwoman. Nolan used Catwoman too, but she was hardly his monster villain, on screen in the same movie with bane. The story of Batman: year one is about police corruption. It’s as if the movie was just based on a snapshot from Batman begins. Just the first third or so of the movie that dealt with Carmine Falcone as the villain. Falcone is in this movie too, pulling the strings of bribery in the police department. Batman begins used three villains, each one darker and more devious than the last, and each one brining forth the next one, with a connection to the villain that was coming next. In that movie, there was carmine Falcone who had deals with the scarecrow, who was brining things in for Rhas Al Ghul. In Batman: year one, it’s really just the police Commissioner Loeb and some of his goons who are the villains. The lack of villains really hurts the movie. Instead of making it a superhero film, it makes this much more like a seventies conspiracy thriller. 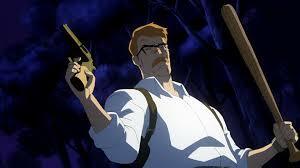 Bryan Cranston, of TV’s breaking bad, voices Commissioner Gordon and he does a nice job with the role. Still, it’s weird to see him as the sort of star of the film. We spend time with Gordon at home with his pregnant wife and learn of the affair he had with a woman who works in the district attorney’s office. The police try to use photographs of this to blackmail Gordon into dropping the case against corruption in the department. For calling this movie a Batman film, there’s actually very little Batman in it. We see him have the experience with a bat, where a bat flies in through the window of his home and lands right on top of the statue of his father’s head. Bruce Wayne sees this as an incarnation of his father or something and takes up the symbol. That’s a cool idea, but from there we pretty much see Batman in action, with no training or explanation of all the steps that would have come in between. A big part of what made iron man so much fun was watching him perfect his costume and equipment. Like the scenes of him testing out his flying jet-powered boots. In Batman: year one, there’s no warming up and practicing. The action is pretty good here; there just isn’t a whole lot of it. When Batman does fight, the camera moves around him and shows off his fantastic moves. Each scene has wonderful backgrounds too, including rain at night. But there aren’t enough of these action scenes and instead, this becomes more of a film-noir like mystery than an action film. Only there really isn’t any mystery either. We know who the bad guys are from the very beginning and there are no surprises with that. Batman Year one is terrific from an artistic standpoint, but from a movie standpoint, it’s just okay. The characters might be interesting, especially Commissioner Gordon, but the story and action aren’t nearly as strong as the should have been. This movie is clearly going for gritty realism over anything else. It wants to prove that this type of film can feel just as real as a live action movie. The problem is, we don’t really want that from a Batman movie. Not even a live action one. Nolan knew that, which is why he gave us monsters for villains. Batman: year one never does anything like that. The lack of villains and lack of action both hurt the movie quite a bit, and yet it still comes across as a cool movie, just one that could have been a whole lot better.